Come to one or all of these great sessions to deepen your understanding of Ayurveda’s ancient wisdom about longevity and wellbeing, and how it can make a real difference in our modern daily lives. 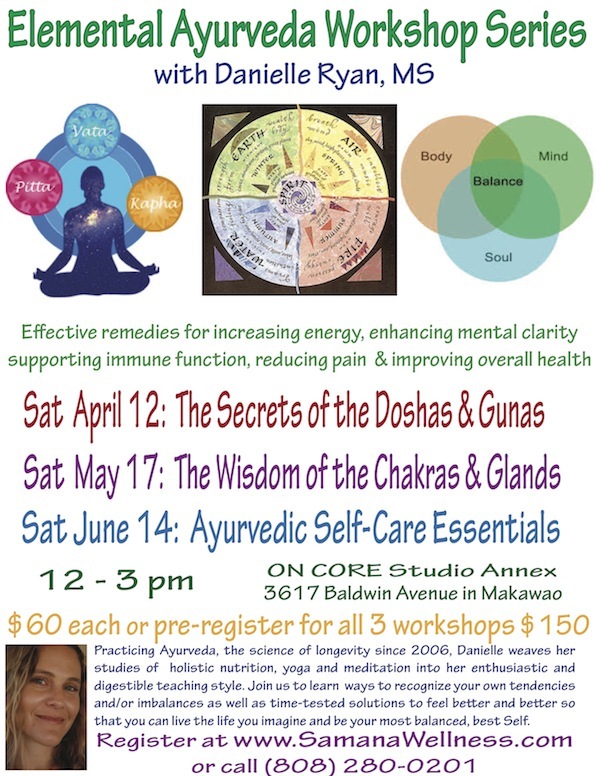 These workshops will be a digestible fusion of Danielle’s Ayurveda studies over the past eight years with DeAnna Batdorff, Myra Lewin, David Frawley, and Jai Dev Singh incorporating teachings from Vasant Lad, Robert Svoboda and Maya Tiwari. Space is limited, register online now to reserve your spot! Email Danielle with questions or for more information.